Have you ever come home from a garden center with a pot (or several), then wandered around the garden trying to decide where to plant. Perhaps worse, have you looked at established plants in your garden and decided that some rearrangement was necessary. Alas, plants are not as easy to rearrange as the furniture. And they may not appreciate moving over there when they have settled in over here, resenting all that digging, delving, and root disturbance. If it is trees that are under discussion it may require heavy equipment. Which means damage to anything growing between pavement, tree to be moved, tree in new location. It just gets worse and worse. Better to design a garden before planting, rather than afterward. "Wait!" you say. "Those small circles on a sheet of graph paper don't look anything like a garden to me." Take heart. it says so right on the cover. How do they expect you to do that? There's a heavy plastic folder attached to the cover on the left. Ignore that for the moment. Looks like a book on the right, with pages of text. 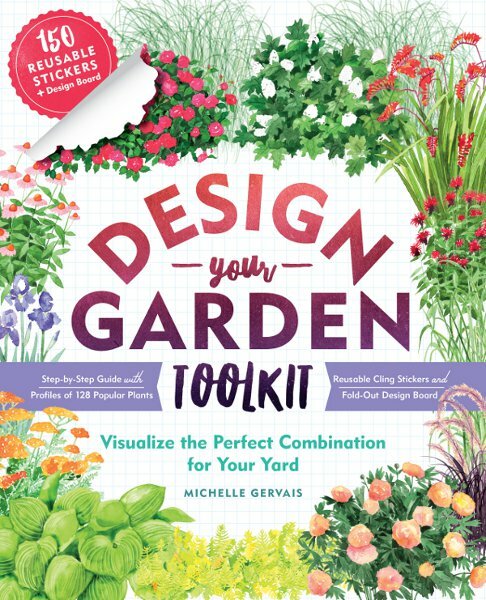 Design-Your-Garden Step-By-Step Guide. Introductory page of how to use the toolkit, playing with plants. 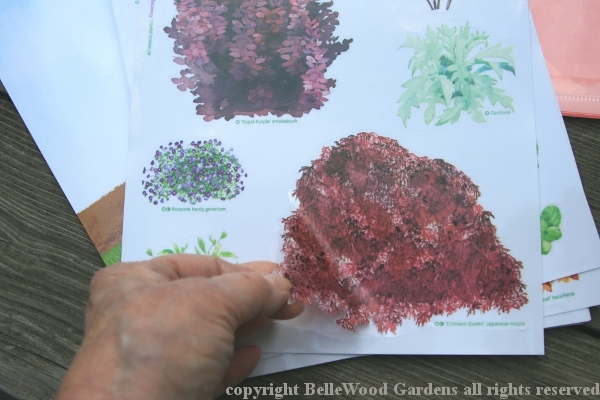 Michelle discusses some of what she calls keys to designing a beautiful garden: harmony and contrast, color and how to use it effectively, texture, flower and foliage size and shape, and more. After all that, she wants you to meet the plants, nearly 80 of them. "So what," you grump, "I've seen books like this before and I still don't get how I'm supposed to pick and choose plants, put them together, and have it be a beautiful garden." Just calm down. Remember that folder? large & small, 14 pages worth, to be exact. 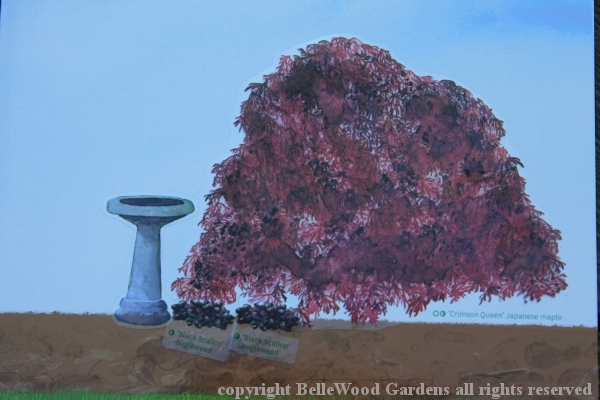 Mostly perennials, a few shrubs, a couple of tender perennials. And they are reusable so redesign is easy if you want to make changes. Some are provided in pairs or triplets. There are even a very few accent stickers: a a large blue container, a birdhouse on a post, a couple more. There is also a large laminated fold-out design / work board on which to arrange the stickers, dirt and sky on one side, and a grid (like graph paper) on the other. create a garden. One nice touch - each plant sticker has its name in small green type on the sticker so you don't have to try and remember what you were playing with. One quibble, most of the foliage plants have leaves other than green - gray / silver, chartreuse, purple. Green is a perfectly attractive, useful color for garden plants. 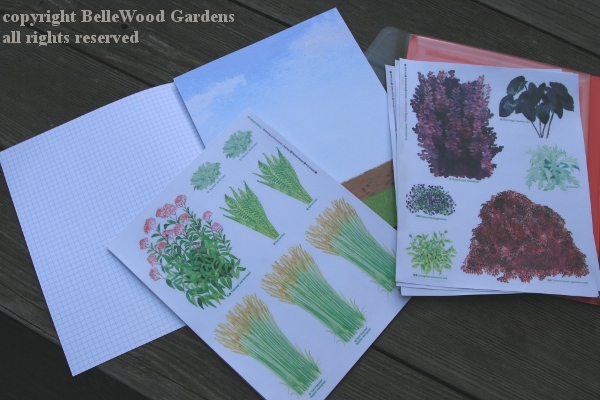 While the diversity of plants stickered here have suggested hardiness range anywhere from a low of 3 to a high 10, I feel that this fun little sticker book is most useful for novice gardeners in zone 5 to 8. 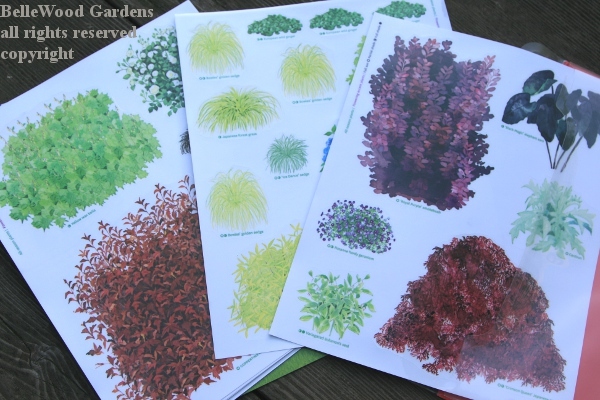 It would be wonderful if there was a supplemental sticker package with additional plants - annuals and bulbs, perhaps - available as a separate purchase. A clever way to explore basic garden design before actually buying plants and then digging in the dirt.